The Sheboygan Rifle and Pistol Club takes great pride in being one of the nicest ranges in our area. Our number one goal is safety, with a theme of “Every projectile fired here stays here”. In this light, our club has attended range safety seminars and follows the guidelines of the National Rifle Association for range safety and development, exceeding the requirements in most cases. With an intent of keeping every projectile fired on the range itself a few other safety measures have been put in place. Side berms run the entire length of the range. On the range shorter walls have been erected and painted orange to encourage shooters to make sure that their targets are set at the proper height to make sure their projectiles go directly into the berm. If they see orange behind their target, they are to change the height of the target to ensure safe shooting. All projectiles are fired in one direction, directly into dirt berms designed to capture each shot. There are 3 static distances for shooting with individual berms for each one. These would be 50 yards, 100 yards and 200 yards (though shooters can safely also use the range in distances in between any of those ranges). A cement wall separates the 50 yard range from the 100- and 200-yard ranges allowing shooters to safely change targets on one range without affecting shooters on the other. A new feature to the 50-yard range has been a “Bullet Catcher”, something ranges will see more and more of in the future. When studying ballistics, it was noted that lower velocity cartridges (9mm and other pistol cartridges in general) do not always have enough force at longer distances to drive into berms and tend to follow the plane of the ground after impact, often rising over the berms. To avoid this potential and take preventative measures the club invested in constructing a metal roof that overhangs the entire impact area of the 50-yard range further guaranteeing that should a round rise after impact it is captured and kept on our property. To signal that the range is “Closed” or “Cold” (there is to be no shooting) each side of the range has its own individual light and alarm system. Push buttons on the firing line activate an alarm while flashing lights are activated thereby offering both a visual and auditory signal that the range is “Closed” for that moment. Firearms and other equipment on the firing line are not to be touched during this time, and only when all shooters are safely back from changing targets or whatever else needed to be done that the lights can go off and the range “Open” or “Hot” again. A basic first-aid kit is available in our target shack, and an AED is also available along with a higher end First Aid Kit by our bathrooms for use should either be needed. 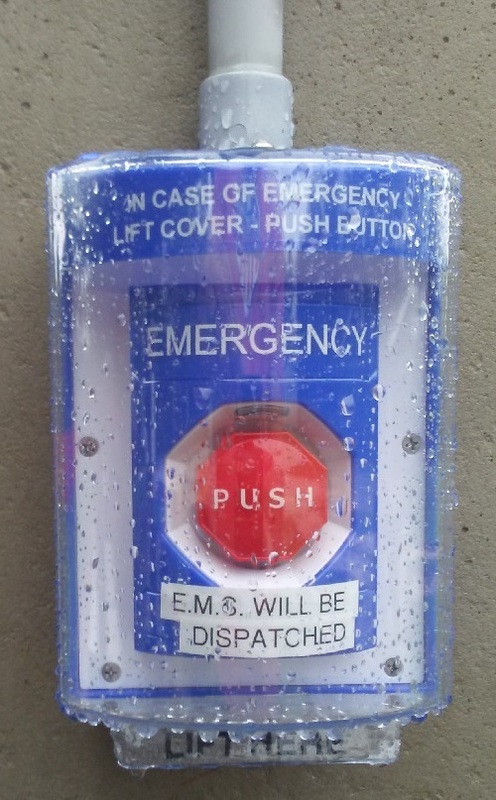 The most recent addition is an emergency switch that once activated automatically sends help to the range should there ever be an incident and aid would be needed. Though we should never need to use this, it is the kind of proactive thinking our club tries to have and put in place to meet our goals of maintaining a safe range. A high-end camera system provides constant surveillance of, and records all activities on, our property. With a goal of passing this land to the future, we feel that these measures combined with our Range Safety Rules should help ensure our ability to provide a safe place for firearms use and education into the distant future.